For tough, demanding working conditions, the SPE Airless Spray range is the ideal solution for the application of epoxy coating, polyurethene and solvent materials. A tough, durable and proven design with the added benefit of easy maintenance. SPE range of Airless Spray Equipment - tough, durable and proven design with the added benefit of easy maintenance. For tough, demanding working conditions, the SPE Airless Spray range is the ideal solution for the application of epoxy coating, polyurethene and solvent materials. Coming in a range of 3 products, the Airless Spray range caters for light duty all the way to heavy duty applications. SPE ranges of Airless Spray units are designed for rough working conditions found in shipyards, the petrochemical industry and fabrication sites. 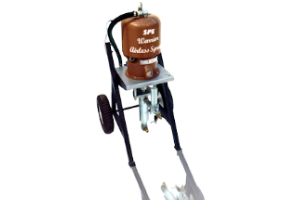 The pumps can be used to apply epoxy coatings, marine paints, and solvent less polyurethane and fire retardant materials.